This is a huge question, one that I certainly cannot fully address in one post, but I thought I’d start plugging away at it. 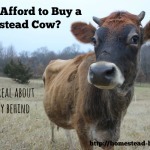 Yes, homesteading can be expensive. If you are choosing to homestead on acreage, as we are, then there is the cost of land, of infrastructure like a road, or water. There is the cost of purchasing, renting, or building your home. There are expenses related to gardening, to preserving, to caring for livestock. There is a never-ending list of chores and projects, most of which costs money. Real hard-earned cash. We had received an unexpected gift of money, partially from a relative passing away, partly a gift from family. With this gift, we could have made a nice down payment on a small piece of land in Oregon. For years we dreamed of purchasing the property on which we rented an adorable little cabin. We talked to our landlord, we brainstormed with neighbors, we crunched numbers. 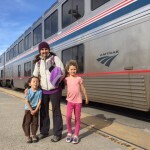 We slowly (and sadly) realized that we could not afford to live in Oregon (at least in that area), and continue to live the life that we value – one of hard work and hard play, one of community and connection, one of spending time with friends and family. With two young children, our priorities had shifted dramatically, and having a livelihood that allowed one of us be at home with the kids felt really important. 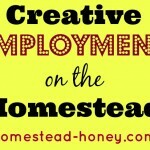 We began to critically evaluate how we could achieve this goal, and AND homestead in community. And then, a piece of land next door to good friends in Northeast Missouri came up for sale. The land was cheap. So cheap that we realized that we could purchase acreage outright, and still have some money left over to build a small home and put in some basic infrastructure. So, we opted to make a huge move to a new state and start over debt-free, rather than stay in Oregon. Can I Afford a Homestead Cow? 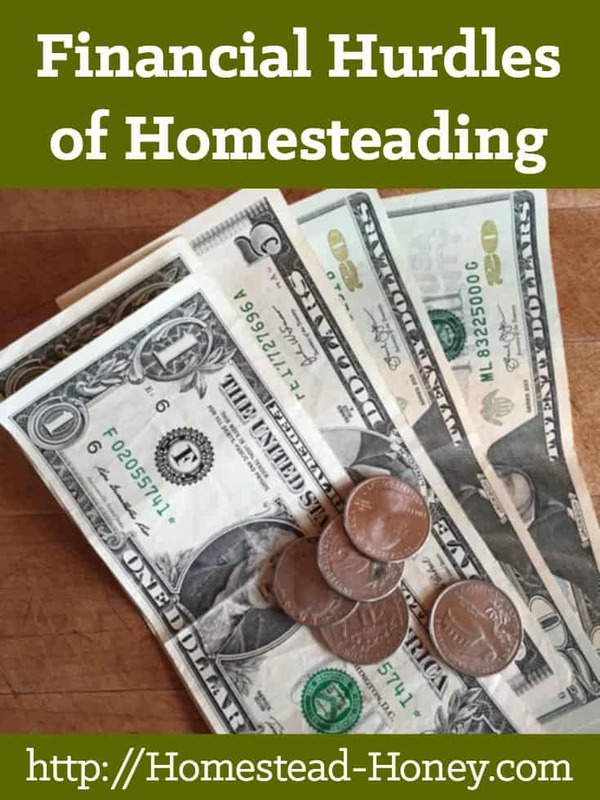 What have been your biggest financial hurdles to homesteading? I’d love to hear about it in the comments below. After 27 years of marriage we finally became debt free… there is no freedom like it. Great post, looking forward to hearing more about it. I can’t say that it has been the easiest transition, but definitely rewarding in so many ways. Wow..i cant wait to hear about the rest of your journey! Good topic that nearly never gets covered! 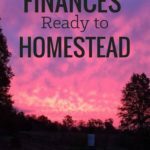 We’re coming to the end of our first year on a “proper” homestead (not an urban one, an actual acreage) and it’s been shocking how the expenses have piled up. I think a lot of people assume that living simply and living cheaply are one and the same – they’re not! Good for you for being brave enough to make the right decision for your family – lots of folks wouldn’t have the courage. Congratulations on your first year! We are almost at our first year in Missouri! Yes indeed it is shocking how expensive things are. I think I spent 500 dollars on fruit trees alone this year!! Thank you Emily. We are fortunate in that my husband’s skills were transferable to a new location. I am still trying to figure out part-time employment. We sold everything we owned and moved across Canada. A few months later had enough to buy land with CASH and build a shop with cash. Now we have saved some money over the last year to build our home. It’s going to be small but we think this was very cheap. The money you save when you build things yourself is BIG. When you live very minimal, it can be done. Yes, it’s true. Not paying for labor is one of the ways that we are really saving with this house construction. That, and the time and effort we’re putting into sourcing reclaimed materials. At an auction today, my husband got tongue and groove flooring, several stacks of wood, and assorted tools for $65! We are trying to homestead ourselves – but it’s taking a lot longer. We bought our land 7 years ago and have been slowly improving it – as we can afford to with cash only – while we live in our current home and hubby continues to work. 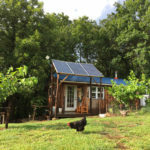 The future homestead is about a 1-1/2 hour drive away from our current home. During weekends and vacations we have put in a septic tank, solar powered well, fruit and nut orchard, tool shed/guest cottage, cut in a new road to make a loop for big trucks (cement trucks) to get in and out of our property (county code) and have set up a nice place for our travel trailer so we can live comfortably while we are up working on the property. Everything is just about ready to build our new home – as soon as I can get hubby to retire! We want to live as simply and sustainably as possible with a nice raised bed garden, bees, chickens and the orchard – off grid. We aren’t really “preppers”, but we know that with the cost of living constantly rising and our income (pension and social security) at a standstill, it will be more important than ever to not owe anyone anything, except taxes and insurance! Of course, we will still want to have internet and satellite TV, and we plan to do some travelling once everything is in place. But we should be financially “set” with no mortgage or energy bills and a greatly reduced food bill – which will enable us to enjoy these “finer” aspects of our retirement. Thanks for sharing this Vickie! Sounds like you are working hard toward your end goal. Just think how much you will enjoy living there full-time when it finally happens! I just stumbled across your blog. I am so glad that I did. My husband and I are currently on a journey to save, prepare for, and and eventually buy our own mortgage-free homestead. We also currently live and Oregon and have realized that there is no way that we will be able to afford to remain debt free and buy land here. So we are looking elsewhere…(perhaps northern Idaho) and saving up for all those financial hurtles. In the meantime, I look forward to reading about your journey! I love reading about families that are a few years ahead of us on their dream. It motivates me to keep chipping away at our dream. So nice to hear from you, and I enjoyed reading your post. I am sure you read that we moved from Oregon! One factor that was huge for us was community. Having a few families that we were already close friends with made our transition much easier. We are also dreaming of buying some land in Missouri. I was wondering- what price range were you able to do this with? 0-50k, 50-100k? Just some type of a ballpark figure. I am guessing that it is around $20-30k from what I have seen of Missouri. Well, the land was about $1700/acre. And the building hasn’t been finished, but I would guess that we’ve put about $45,000 into the land and house so far. That is in the ballpark that I was expecting. We are looking at about that price range as well. Just to give you some perspective, we paid $6,100 for the home that we live in now so $20,000 for an acreage is what we’re willing to spend, and yes, we can do it. Many people will say “No way” but they don’t think like we do. The biggest factor is patience and through research for months or even years before you are able to buy- so that when you are able to buy, you know what to wait for. Just for perspective, I just saw 15 acres in Missouri on a nice river that was a former mobile home park go for $45k not long ago. A fishing cabin less than 1 mile to the water, no lake view, 1/8 acre went for 10k. Homes in small towns with multiple lots are available for 10k or less in nearly every small town in America. People pay one way or another- and if you can pay in one way (longer distance driving to jobs) you can save in another way (less mortgage). It is ALWAYS a tradeoff- and we picked the one that is the cheapest on the budget and will now get cheaper with the manufacture of the ELIO! Yes, the affordable land in MO was one of the big drawing points for us, but I am paying for it in a lack of cultural opportunities and work opportunities (I work and perform in the arts). So it is a tradeoff. Some day, maybe I can work out a house-trade for a few months, and let someone have a homestead experience while I get to live in their downtown loft and see all the shows I can! I’ve found that adding new ideas and projects gradually and steadily has helped us deal with living the homestead lifestyle. We’ve been at it for 28 years and we still feel that we have so much to learn. It’s truly a never ending process. Enjoy the journey. No need to rush. Yes, that is so very true. We had to do some major projects all at once when we moved onto our raw land, but now we tackle one big project a year.